The best first: The neighbor’s children challenged me to a water fight. I’m just checking my Facebook quickly before the kettle boils. Mean jokes for you. Enjoy! What is the last thing to go through a fly’s head as it smashes against the windscreen of a car going 70 mph? I took my mother-in-law out yesterday morning. 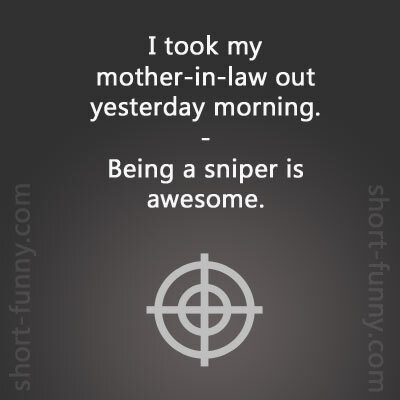 Being a sniper is awesome. I’ve had some problems lately, so I decided to turn to alternative treatments. I’m pinning my hopes on that Asian thing, you know, with the needles? Working in a bank is a very ungrateful job. A lady asks me to check her balance – so I push her over, they fire me. I tried sharing a sandwich with a homeless man on my way to work today. But the meanie told me to go find my own. DAD : Son, they prevent questions just like that one. I asked the stewardess to switch my seat on a plane because I was seated right next to a screaming baby. Apparently that's not something they let you do if the baby is your own. I don’t understand why the authorities even bother to punish polygamy. Two mothers-in-law is already cruel enough. In 1827, Dracula started to feed on a diet of 16-year-old virgins. By 2013, he died of starvation. Wait, don’t move, you’ve got something on your face! What’s black and white and red? A nun that’s fallen down the stairs. What’s black and white and laughing? The nun who pushed her. Why is the Great Wall of China considered one of the seven wonders of the world? Because it is an actual long-lasting Chinese product. I just ran over a deer. I had to process that. There’s a new lipstick on the market, it is guaranteed to help you lose lots of weight, and fast. It’s marketed as a glue stick. Two guys want to escape from a psychiatry institution. My poor skills as an electrician often leave people shocked. He was the crappiest mechanic the Luftwaffe ever hired. What do freshly pregnant teenagers and their babies share? God created childbirth to give women the chance to experience what it's like for a guy to catch a cold. What happens to the children that are not picked up from Smallland in Ikea? And what are Köttbullar made out of? I yelled: “It’s a boy!!!! I cannot believe it – it’s a boy!! !” I was so overwhelmed, I literally stood there in tears. “It is with a sad heart that we inform you our beloved brother, Roger Kripsky, finally found his peace on April 7th, 2018. I tried to phone my cousin in France in 1943 but the line was occupied. A box of matches. The perfect housewarming gift. Do you know the difference between a horse and a cactus? What?! Well just try sitting on one, then you’ll know it.